Successfully Added 5 Watt GU10 LED Spotlights - 500 Lumens, 3000K, 30000 Hour Life, 25 Degrees Beam Angle to your Shopping Cart. Save money and benefit from high efficiency LED technology with this 4 Pack of GU10 LED spotlight that will lower your electric bill and help save the planet. Over 80% more efficient than standard spotlights these 5 Watt LED spotlights will bring you real savings. Emitting 500 lumens of light each this 4 pack of LED spotlights will pay you back in a short time while brining the same level of lighting enjoyed by halogen bulbs. With zero UV radiation emitted these LED lights produce very little infra red light and are ecologically friendly because they are free from toxic chemicals such as those found in CFL bulbs. Emitting light at about 3000K you can enjoy a warm white light that's suitable for kitchens, bathrooms, display cabinets or a variety of commercial uses. 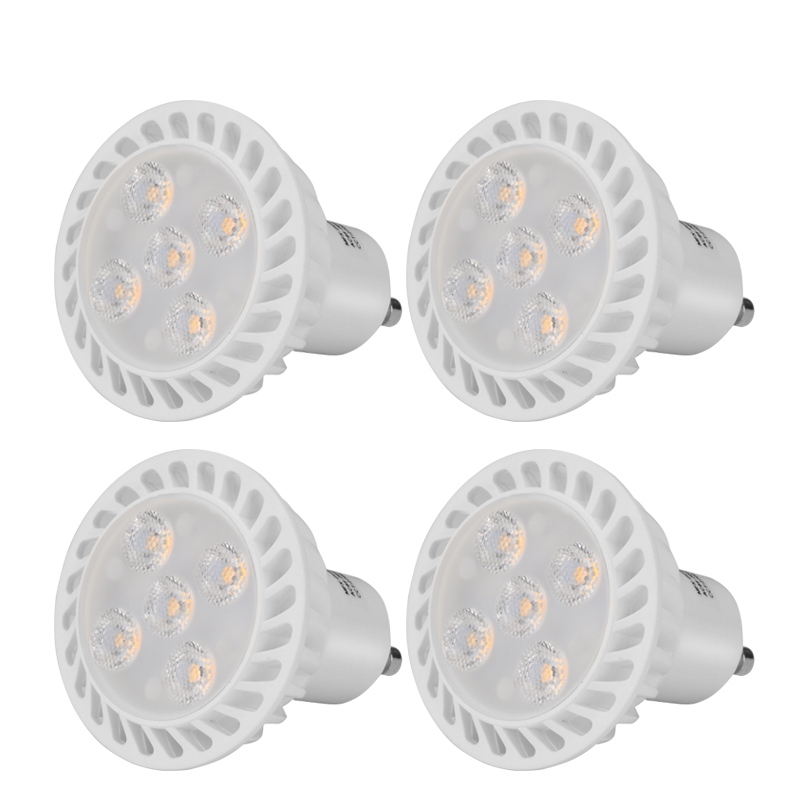 Suitable for 220V GU10 fittings the LED bulbs have a life span of around 30000 hours which is over 40 months of usage so you can go years without ever changing a them. Each bulb consists of 5 LEDs each using 1 Watt of power so for a fraction of the power a halogen spotlight uses they will bring you each 5watt bulb will bring you the equivalent light of a standard 40 watt bulb. This pack of 4 GU10 LED spotlights comes with a 12 months warranty, brought to you by the leader in electronic devices as well as wholesale LED spotlights..